Today every one of you and me aware about Blogging Business and the ways to make money from the blog. Overall, Google Adsense is the best program available on the Internet. How do you feel about making money online? It’s definitely a worthy idea. But how much money can you make? Let us see the possibilities of making great revenue from our blog. However, the blogging platform must be chosen very carefully. While there are many ways that can help you earn money online, some of these might end up being scams, so be careful. Also, when using online avenues to earn money, don’t expect to earn a huge amount quickly. Anyone with a computer and access to the internet can make money online. And at first, the process may seem to be difficult and confusing, so patience, ambition, and perseverance are a must. You can definitely make it happen if you are determined, focused, and apply the right methods. What is Blogging? How to Make Money? I’m sure you’ve heard the word blogging, and many of you might wonder, “What’s blogging?” Blogs are a great way to share information or to give ideas, and the best way to make money! Blogs grew in popularity and even became a kind of personal diary for some people. Some bloggers have created informative blogs in various niches and now have amazing revenue to show for it. If people enjoy the things you’re saying or writing in your blog, sure they will come back often and this creates loyalty that’s great for bloggers trying to make a second income. Your search engine rankings will grow once your visitors increase and the amount of content you add increases. Blogging has become part of the daily life of many people. A blog can be started in several ways. You might sign up on Blogger or WordPress for a free account, or you might even set up a blog under your own custom domain. Wondering about How to Make Money using a Blog? All you need to do is to monetize your blog through the various monetization options available. The best option here may be Google AdSense, which is the best program available on the Internet powered by Google Corporation. In this business, Google will put advertisements related to the content on your blog and share the revenue generated from those advertisements. Apart from Google Adsense, there are a lot of other ways to earn money online, which will be discussed below. Before getting into the actual subject, let me explain you few basic ideas to earn money from the Internet. It’s not that hard to earn money on the Internet until we can find the exact sites online to earn money. There are also various ways of earning opportunities online, some of which are more popular than others. A lot of sites now provide money to write articles. Some websites give money to write specific types of articles and some accept articles of any kind. Few websites provide information to write an article about the topic and the people are also doing this as a full-time business. It’s generally not that easy to write articles and it needs a lot of practice. 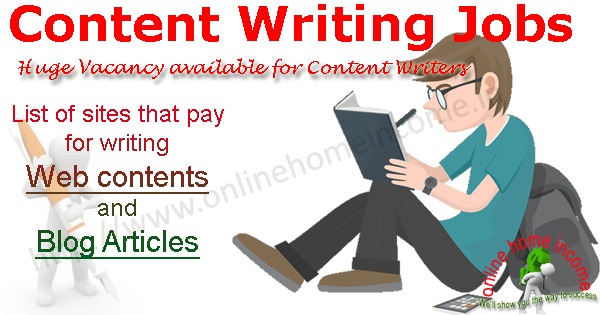 Article writing jobs are something like a boon that can be achieved, but some rules and regulations need to be followed. This makes your articles more attractive and when reading, people don’t get bored. Now coming to the payment, some sites give an offer for your articles after submitting them and ask if you like it or not. Some sites tell you how much money you will get before you write articles, and some sites give money according to the number of visitors to your article. Surveys are a set of queries to be answered. Overall surveys are a series of questions you need to give your opinion on. There are few genuine survey sites where you need to complete your profile with some details such as your job, hobbies, educational status, personal details and much more. You are then assigned with surveys after completing the preliminary tasks, which match your profile. The more money it takes to complete a survey, the more time it takes. A typical survey will take about 10 to 15 minutes. Usually, survey sites provide individual payouts, i.e. your PayPal account will be updated with that money if you earn $2 for a survey. But some survey sites keep a minimum payout and you will be allocated checks after you reach that minimum threshold. This is another popular way to make money as well. Before writing reviews, you need to register with the companies first. Companies generally want reviews of new products on the market as people need to know about the product. More review sites such as computer-related reviews, mobile phones, gadgets, etc. as they are the products that move faster. Some sites like Swagbucks provide incentives and some sites also give straight money as well as incentives. This is a very good opportunity to earn money right now. This is one of the most popular online money-earning methods. While this is the hardest way to earn money that takes longer to earn. You won’t get any money from your blog for the first few months until your site gets some traffic. It’s going to be a very difficult time until your blog becomes popular. Once the blog becomes popular, people can begin to make money. It’s hard to find good blogs right now because they need to be regularly updated. Blogs generally need some patience. Once patience has been lost, it’s hard to keep the blog. Affiliates are like a part of a business and it’s simple how affiliate marketing works? You need to promote the products they give, and if people buy those products from you, you’ll get a percentage from the sale. This is one of the hard businesses, but if you know the secret, it can produce dollar shower. There are very good tutorials on the internet right now to learn the tricks. So that’s also a good way to earn, but there’s a big competition to make money like this right now!!! 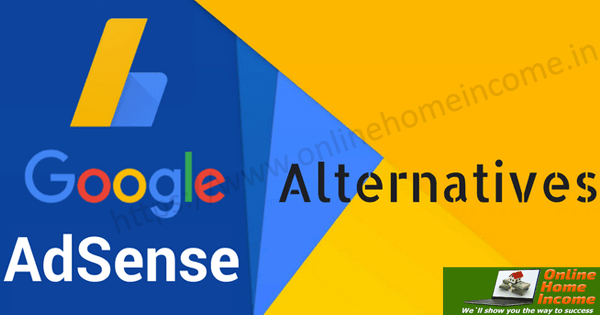 Why would you need Google Adsense’s alternative? So, basically blogging success entirely depends on the Google Adsense Program and if in any case, you were banned by Adsense means not the end of your blogging. There are many other best Google Adsense Alternatives were on the market that let bloggers earn money. 1.) When you are banned from Adsense: Newbies with a curiosity of earning more revenue every day, might fail to follow the strict rules of the Adsense Program. Once you found to violate any rule, Google will notify you in your account, failed to respond will lead your ban. 2.) You Avoid Google: Some people believe that Google is making things for their convenience and hence those people will usually avoid using Google products. 3.) Display more ads: Adsense has a limitation of up to 3 ad units per web page. You may need to show a few more ads from another network if you have a large scrolling page. 4.) Diversified Earnings: You want your earnings to be diversified, that’s not a bad approach. It is not a good business decision to keep all your eggs in one basket. While Adsense pays well, you might want an alternative solution ready just in case something goes wrong with your Adsense Account. VigLink is one of your blog’s best ways to monetize. It works very differently from other programs for blog monetization. VigLink transforms your normal outgoing links into affiliate links, and you earn a referral commission from it if users make a purchase. 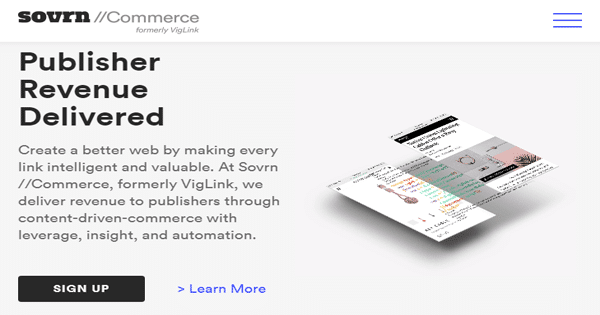 VigLink keeps 25 percent of the commission and 75 percent goes into our pockets, which is not bad considering that we make money from previously non-monetary links. If you want to monetize your blog with Infolinks or any other in-text ad network, try VigLink. Timely payment through PayPal. To monetize your website through CPC ads, BidVertiser is just another network. You can create and distribute your custom browser toolbar and make money from the results of your search. It uses various ad formats such as custom banners, skyscrapers, and inline advertisements and also allows the ad template to be customized. Last but not least, the performance of all your ad slots can also be checked in detail. Bidvertiser pays monthly via PayPal within 30 days of each month’s end if the amount exceeds $10. You can also choose to receive payments through check if at the end of the month your net earnings exceed $100. If you have low traffic on your website, you’ll find Chitika a simple and best Google Adsense Alternatives. After creating an account with Chitika, you can start monetizing immediately. This network uses bidding in real time to get you the right mix of the best ads without committing to any kind of ad. It also supports types of mobile, slider, text, and banner ads, and all these types of ads work well on any device, such as Adverse ads, thanks to its technology. Chitika pays for your earnings made in the current month via Payoneer at the end of the following month after your earnings have exceeded $50. Although wire transfer is also available, it is available only for users who consistently earn 10k / month. BuySellAds is hard to qualify as a direct advertising platform, but it is an excellent alternative to AdSense. The primary qualification requirements are that you need to have a high-quality English-language site with 100k page views per month. BuySellAds supports various types of advertisements such as background takeovers, text image, and text ads. In addition, its ad slots are compatible with AdSense ad slots, which allows you to use both. BuySellAds pays you 75% of your ad space revenue. It disburses payments with $20 as the lowest limit via PayPal or through the check with a $50 lower limit. You can also opt for a $500 threshold wire transfer, but it costs $35 per transfer. For some extra income, many publishers use Ad-buff side by side with Google AdSense, and it also has the potential to replace AdSense even. 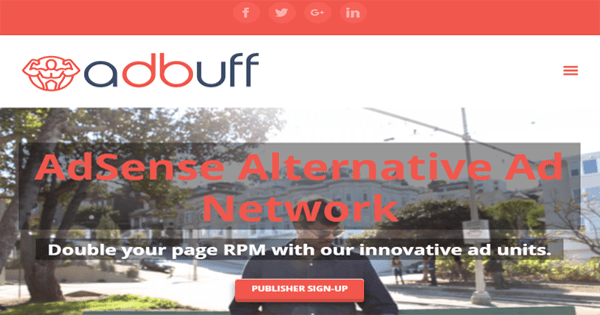 Ad-buff only holds 10% of the network/publisher share and you can keep 90%. As long as you do nothing illegal and have some useful web content, they should approve you. Ad-buff also confirms a 100% fill rate to make sure you get the most out of traffic on your website. You will also have a dedicated dashboard where you can manage and view real-time stats. In addition, an Ad-buff manager will track your account manually in order to further optimize your ads. Up to 3 ads can be added to a page, and Ad-buff works with Google AdSense seamlessly. It has a reputation as one of the most popular affiliate marketing ad networks in the world. This network of ads has earned the status of being a premium and specialized network of pop-under. PopAds CPM Rates are among the industry’s highest. It pays for publishers very good CPMRates. There’s no need to wait for your Popads.net account to have a minimum of $100, not even $50, and not even $10. PopAds.net provides a low payout threshold of $5, and instant payment can be expected. So, they can withdraw their earnings whenever a publisher earns a minimum balance of $5. It offers many ways to make payments to publishers like Paypal, Payza, Payoneer, and Bank Wire Transfer. It even supports referral income of 10 percent, which can be considered as a bonus. For ad service and affiliate marketing, you can join this network. Popcash is an advertising network specialized in pop-under ads that provide publishers with high CPM rates. The reason for offering high rates is simple, it has lots of advertisers all over the world that allow it to provide publishers with high CPM rates. PopCash is a premium ad network offering multiple payment options to publishers. It offers a very low minimum payout. It offers PayPal, Payza payment options. They have a minimum payout of $10 that even small publishers can reach easily with little effort. This company also offers publishers a good 10% referral commission program and so start referring your friends to earn some extra revenue on PopCash. 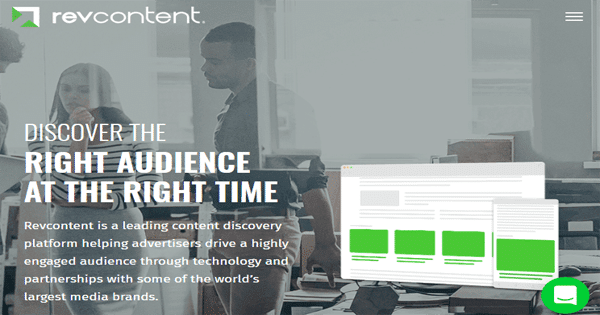 Rev-content is recently growing as one of the best Google Adsense Alternatives with their technology and highly engaged advertisers and partnerships. They help advertisers to drive highly targeted traffic to their online business portal thereby increasing their online sales bring in more engagement. Rev-content has many customization features of displaying advertisements on bloggers blog that will not affect traffic in any way. Every month RevContent offers over 100 billion recommendations to improve user engagement through quality native advertising. RevContent works well with social sites that do not have a very high AdSense CPC. Compared to AdSense, CTR of native ads is typically high. I use this ad network personally as my secondary ad network. You can also try to monetize your website with this ad network. Propeller’s fame is increasing day by day. In the present time, it is conveniently used by over hundreds of thousands of users. It offers a variety of things, making people earn a lot of money. This ad network can be considered an alternative to Google Adsense. This ad network is best for downloading websites for movies or songs. With just a few single clicks, you can easily monetize your site. The minimum payment criteria are $100. So, with Propeller website, give your best shot and start earning easily. You can also earn money from the affiliate program for Propeller. Propeller enables users to refer their mates to earn an additional 5 percent. Media.net is powered by Yahoo! and Bing, and through Media.net you’ll see the only high-quality, high-paying ads. Media.net is a worldwide ad network that has received great reviews. Media.net mainly features contextual ads, which means it hosts page-based advertisements. There are a few items you need to know about First, it may take some time for ads to optimize your site. You can apply for all of them under one account from the same page if you have multiple blogs/websites. Media.net supports payment via PayPal or wire transfer when writing this post. The minimum threshold for payment is $100. Google AdSense is the webmasters and web publishers’ most widely used content-based advertising program to help generate extra revenue. Publishers register for a Google AdSense account, enable Google ads on their websites that are relevant to the content and make money when a visitor clicks on an ad. While Google AdSense is generally considered the current leader in online content-based advertising, however, it is important for web publishers to realize that there are many Google Adsense alternatives were available. These alternative programs can be used in place of AdSense or in addition. In this article, I have covered the ways of earning money online and the alternatives of Google Adsense which is currently becoming a trend!! !